For weeks, our society has been inundated by coverage about the Senate Judiciary Committee hearings surrounding the questioning of Brett Kavanaugh and testimony of Christine Blasey Ford. After United States senators voted to confirm Kavanaugh as the newest member of the Supreme Court, many Princeton Theological Seminary students were left grappling with the overall process and outcome. 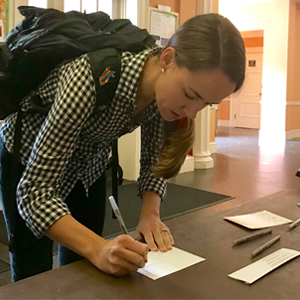 In response, the Seminary’s Center for Theology, Women and Gender (CTWG) coordinated two events: a write-in for doctoral students and a “thank you” message campaign where MDiv students expressed their gratitude to Ford for sharing what they viewed a courageous testimony. Before Kavanaugh’s confirmation, Leslie Virnelson, a doctoral student in Biblical Studies, organized a write-in event. Doctoral students gathered to write reflections (see below) on how their work could provide a lens for examining issues of sexual assault and women’s experiences that have gained greater attention as a result of the recent hearings. I also work to illuminate intersections between disability, sexism, racism, and transsexism. Sexual assault is one such intersection. According to NPR’s series on the subject, persons with intellectual disabilities are seven times more likely to be assaulted than non-disabled people. Women with intellectual disabilities are 12 times more likely than non-disabled people, based on the Bureau of Justice Statistics’ National Crime Victimization Survey. In the national dialogue surrounding Kavanaugh’s confirmation, Biblical Studies doctoral student James Klotz also sees intersections. As a gay man, but one who is white, cis-male, and Protestant, Klotz says he seeks to be cognizant of the power and influence he has because of various identities, and to see how he can use the influence he has to support or empower others. I realize that a significant part of my pastoral work in both pulpit and classroom is simply being there. Listening to a sermon or a lecture by someone who is openly gay and married to another man and is an ordained minister of the Word and Sacrament and specializes in the Old Testament is a novel experience for many churchgoers and first-year seminary students. Part of my own professional development as a scholar is to move beyond mere presence and to find ways that my own research and my own teaching can have an impact on the greater conversation in the church, the academy, and the world around issues of women, theology and gender. Ransom Portis | Who Can Hold Judicial Authority? 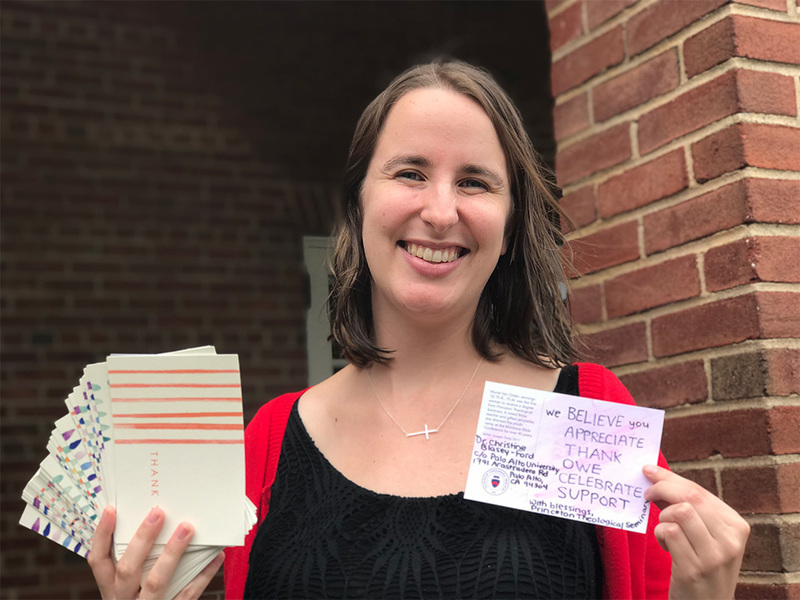 In the week after the Senate confirmed Kavanaugh, MDiv senior Emmie Arnold organized a second event—a letter writing campaign to thank and encourage Ford. For three days, Arnold sat at a table outside of the Mackay dining hall with postcards and stamps. Through events, speakers, and empowering student leaders, the CTWG aims to lead the community in thinking theologically about gender. Learn more about CTWG. Seminary interns bring hope to an organization that serves people affected by mental illness.